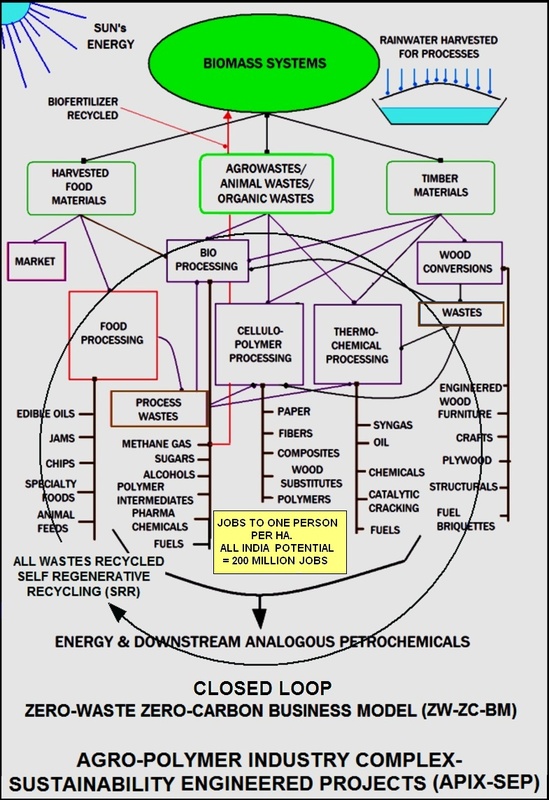 To carry on all of the businesses of utilizing and recycling all available renewable resources and non-toxic wastes, resulting in non-fossil energy, engineering materials, processed foods, bio-petrochemicals, bio-fertilizer, and bio-water by using Zero-waste Zero-Carbon Business-Model, through Agro-Polymer Industry Complex Sustainability Engineered Projects (APIX-SEP), independently and through joint ventures, in India and elsewhere in the world. BASIC BUSINESS: 200,000 banana stems converted: 550 KW Power; 110T Banana Fiber Molded Crockery; 7250T Composite Engineering Product (Molded Doors); 335T Biofertilizer; 6.4T Green Sulfur. All water, organics and CO2 recycled; true Green Zero-Waste Zero-Carbon Business. Entire Energy needs to be generated insitu, using agrowastes (through Anaerobic Conversions); All water needs would be through Rainwater harvest + recycling all the recoverable water from agrowastes and organic wastes. ROI = 300%; break-even in second year ; repayment in 4 years; total dividends to shareholders 1000% in 3rd yr. This entry was posted in Agro-Biogenics Clean-Tech, Clean Energy, Clean-Tech projects, Green Technology, Green ventures, New Ventures, Project Finance, pvhramani, Recycling, Sustainable Development, Venture Capitalists, Wastes recycling, Zero-Waste Business, Zero-Waste Zero-Carbon Technology and tagged Agro-Biogenics Clean-Tech, Agro-Polymer Industry Complex, Alternate Energy, Alternate Engineering Materials, APIX, APIX-SEP, Biofertilizer, Biomass Conversion, Carbon Sequestration, Carbon Sink Engineered Products, Clean Energy, Clean Technology, clean-tech, Clean-tech Investments, Clean-Tech Projects, Clean-Tech Ventures, Cleantech Startup, Cleantech venture, Closed-Loop technology, CSEP, Green Ventures, Hariharan PV, New Ventures, Project Finance, pvhramani, Quadruple-Impact Technology, Recycling, Self Regenerative Recycling, SRR, Sustainability Engineering, Sustainable Development, Waste-to-Wealth, Zero Carbon, Zero Waste, Zero-Waste Business, Zero-Waste Zero-Carbon technology. Bookmark the permalink. Working toward mitigation of Global Warming and Poverty (GWP), reducing the gap between "rich" and "poor"